Swiss Made featuring a Sellita Caliber SW200-1, 3-hand automatic with date. Dual High Grade Sapphire Crystals with anti-reflective coating for a superior look, maximum resistance to scratching, and superb clarity. Numbered limited edition of 1250 watches. 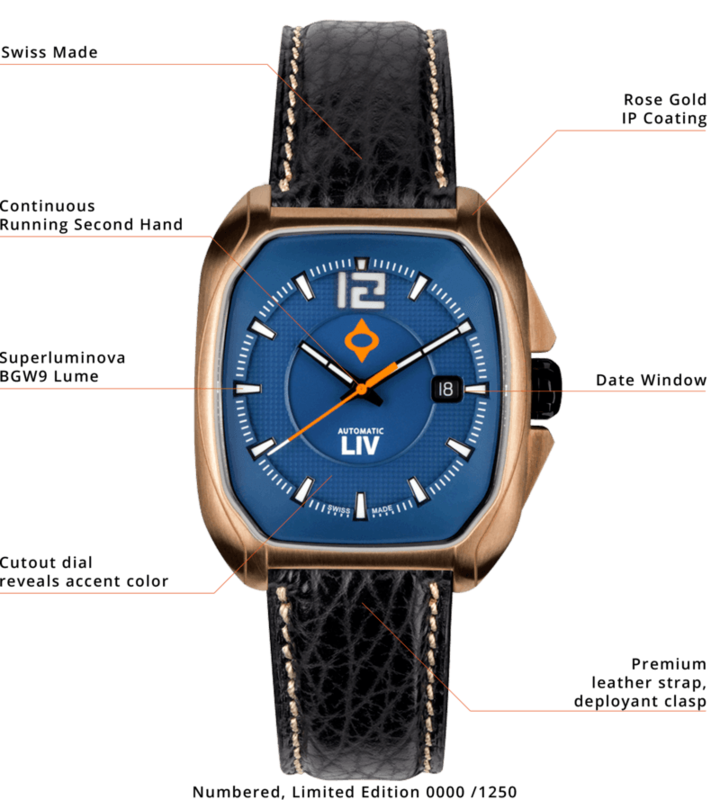 "Beautiful, stylish, out of the ordinary automatic watch! I like the modern, yet classic look of the watch combined with the high-quality finishing. It is just nice to look at it every time! I am very happy and eventually the watch was worth the wait." Our Rebel-A stays true to its name by putting a high-end Sellita SW200-1 automatic 3-hand with date movement in the famous Rebel case. Built by Sellita, a premier Swiss movement company, the SW200-1 packs 26 jewels! That’s the level of some of the best automatic chrono movements. With that insane level of engineering, you can be sure this watch will provide precise time for decades. LIV applied its insane attention to detail with this build as well. We used the finest 316L stainless steel for the cases, CNC machined to within thousands of an inch, the hand finished and polished them to absolute perfection. 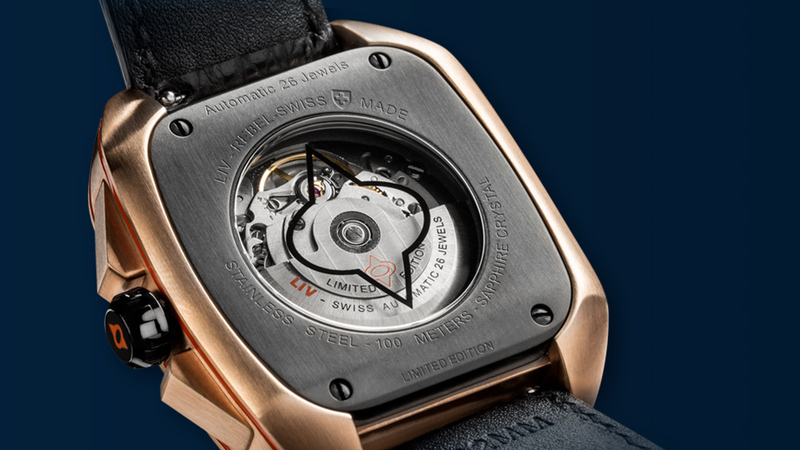 High-grade anti-reflective sapphire crystals showcase the 3D multi-layer dial and the movement. Superb materials were hand-curated and crafted into straps and bracelets befitting a watch of this quality. Bring one home, so your rebellion doesn’t have to pause for a battery change. Numbered limited edition of 1250. Looks elegant and unique with striking color combinations. Love the size and weight of the watch and the way it sits so snugly. Looks sooo much better in the flesh, pictures do it an injustice. Great timepiece I've been bringing on my global travels! This is real swiss craftsmanship, beautiful details, perfect finish. And above all; great design!! So got package was so excited that I forgot to video the unboxing of the watch. The Liv Rebel-A is everything I was looking for. Ive been checking some other sites but the Liv range really caught my eye. The service was great and the delivery super quick. Watch is better in person for sure, feels good on the wrist. Will def be looking to adding few more in time. I purchased two watches from LIV. Both the Rebel. I must say the quality is astonishing and the materials they use are high quality. I can't say I have any complaints. It's worth every penny and I highly recommend you purchase a watch from them and see the quality and astute design. Fantastic watch to watch. Getting lots of attention. Am buying more Rebel watches. Just bought one Rebel DDC orange. Awaiting delivery. I got my LIV Rebel-A right before Christmas and have work it since. The watch has the perfect size for my wrist and just looks stunning. The Sellita automatic movement has been very accurate so far. I wished the logo would be a little smaller, but definitely no deal breaker. No regret in owning one....wearing almost everyday. Looking forward for another one... Thx guys. It really looks good online, but when I received it and got to hold it - wow! It is truly amazing! Also the fast express shipping was great. 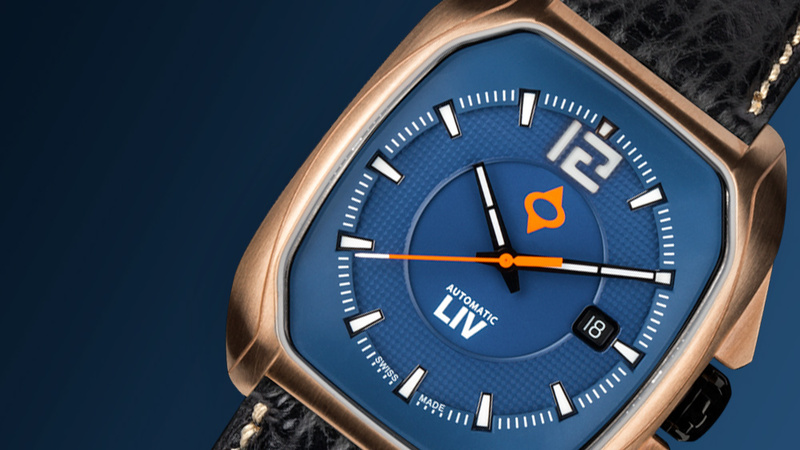 Highly recommend LIV watches. Got my watch a few days ago and I can say that it's really a good value for your money. Build quality is above average for the price point and you get a Swiss movement as well! Among its features I like the multi-layered and textured dial as well as the rubber strap. Very comfortable and sits well on the wrist. Got my watch on a discount and at this price point I'll probably buy again! Congratulations to the Liv team!